The 9th annual Sussex Go Red For Women luncheon and fashion show held in September at Baywood Greens raised $12,600 to support the American Heart Association as it works to reduce heart disease. This is the largest amount the luncheon has raised. The event, sponsored by Beebe Healthcare, drew women from around the area. Keynote speaker was Rajinder Prasad, MD, FACC, a cardiologist and Medical Director of the Dean Ornish Program for Reversing Heart Disease™ and Cardiac Rehab at Beebe Healthcare. The picture here represents the presentation of the check to the American Heart Association. 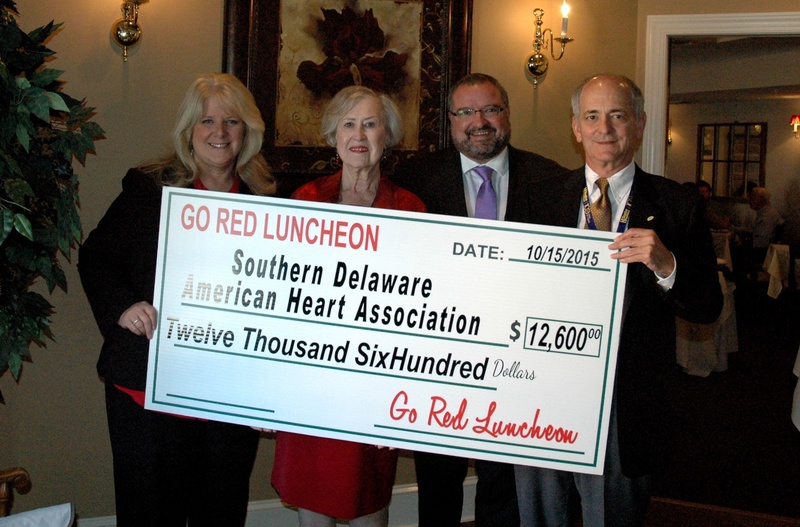 From left to right are: Karen Gritton, a special events director with the American Heart Association; Pat Sandy, Co-Chair of the Sussex Go Red for Women luncheon; John Pierson, Delaware Executive Director of the American Heart Association; and Jeffrey M. Fried, President and CEO of Beebe Healthcare.